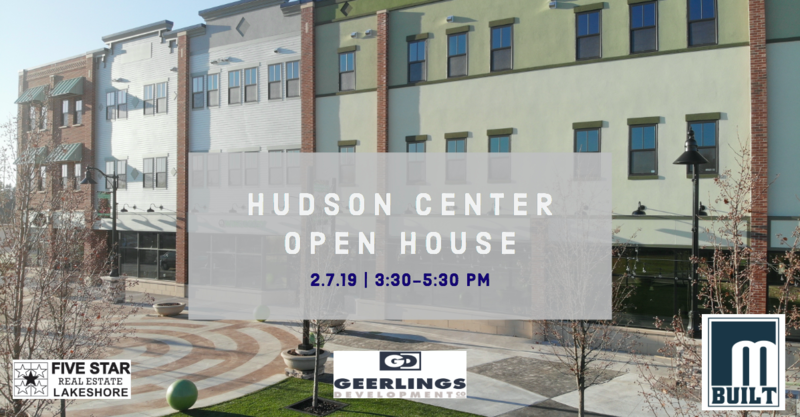 Come out and see Hudson Center at the Hudson Center Open House on 2.7.19 between 3:30 and 5:30pm. Visit the businesses and be entered to win some great prizes! Check out the event page on Facebook for more information. We hope to see you there! Businesses in the new Hudson Center building in the city’s developing new downtown are doing brisk business in their first few weeks of opening. Lunch and dinner crowds at the Wing Doozy restaurant have been sometimes “overwhelming” said owner Todd Penning who with partner Randy Moeller picked the Hudson Center for their third West Michigan location and opened a month ago. “We were pretty sure the Hudson Center would be a good location for us and it has exceeded our early expectations by a lot,” said Penning whose company also operates Wing Doozy restaurants on Plainfield Avenue and in Wyoming. Businesses in the new building are bringing an estimated 100 new jobs to Hudsonville. The new three-story Hudson Center is hosting an “Open For Business” reception with public tours on Thursday Feb. 7 from 3:30 to 5:30 p.m. to introduce the community to the new businesses that have opened in the $4.5 million commercial and residential complex. Construction on the 25,200-square-foot building at 3424 Chicago drive began in March 2018 and completed in November 2018. In addition to Wing Doozy, the Hudson Center is also home to Dorados Mexican Grill and Bar AND 317 Coffee on the ground level and a women’s clothing boutique Lou + Marie next door. “I grew up in Hudsonville and it is really great to start having more variety of restaurants and businesses coming into our community,” said Charity East, who has already become a regular at Wing Doozy and a neighboring coffee shop. The $4.5 million building is an investment by Geerlings Development of Zeeland and built by Midwest Construction. The new Hudson Center is adjacent to the city’s new Terra Square farmers market and event center on the recently developed Harvey Street Woonerf, a park space built by the city of Hudsonville. “This is the start of a downtown core for Hudsonville that will connect the Hudson Center, the new Terra Square and other centralized buildings around a walkable plaza,” said Geerlings Development President Scott Geerlings. On the second level of the building are Affinity Financial Group, Code Green Creative and other office space available through Colliers International. The third floor offers residential apartments for lease through Five Star Real Estate Lakeshore. Hudsonville has not had a traditional downtown area. The current Hudsonville business area is a one-mile stretch of mainly detached, single-story buildings that grew up along Chicago Drive in the 1950s when the highway was the main north-south corridor to Indiana and Chicago. “And people are coming downtown to enjoy the new restaurants and places,” he said. The development of a downtown core is part of the city’s ““Imagine Hudsonville 2030” Master Plan. The city bonded for $5 million to develop downtown infrastructure and is doing it without raising taxes. In 2017, the city opened the first section of the development, the $2 million Terra Square farmers market and event center as the first phase of the new downtown. For more information or interviews on the new Hudson Center building contact Geerlings Development President at 616-218-6793.